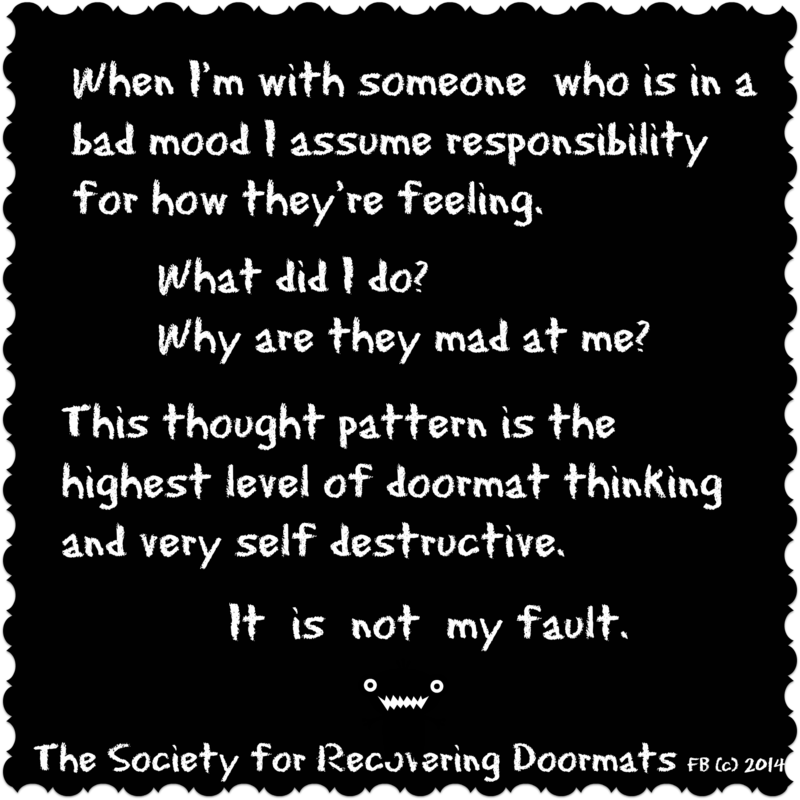 Thinking you’re responsible for others moods, behavior, choices and happiness is an underlying problem for most doormats. Many of us are empaths, empathizing and experiencing the feelings and thoughts of others as our own. And worse; taking responsibility for them. Detaching is an arduous task but can be achieved. Next time you’re around someone who’s in a funk, remember this one truth: “It’s not my fault ” and respond accordingly. Unless your life is reclusive, and interaction with others is negligible, reminding yourself it is not your fault is paramount for becoming and remaining a recovering doormat. Great awareness for everyone to keep in mind. The more I read your words, the more I realize I need them on speed dial in my head. I cannot seem to retain them. I read…..the words speak to me and then sink in the quicksand of the old mental status quo of my thinking and feeling. I must need a crash course in deep mind / emotion retraining. It’s like a rubberband that snaps back to its original shape. Ivy, would you consider renting space in my head for a while? Lol. Any suggestions on how to saturate myself to begin the reprogram process.? If it were possible for me to ‘rent space in your head’ I would. But, alas, I don’t think I have that kind of capability at the moment. Might I suggest visiting my on-line-shop where there are many useful motivational items to help you remember to ‘stand up and speak out’ and combat doormatism. Here’s the link- http://www.cafepress.com/thesocietyforrecoveringdoormats If you don’t find what you’re looking for, I will be happy to custom make anything you want. Just message me here.